This item is available from Amazon, among other places. I do not recommend the metal one. Too many reviews have said it to rust even with meticulous drying. I also don’t suggest Lehman’s. They overcharge, and their quality isn’t up to their reputation, unfortunately. The first link (at the time of writing this) is cheaper than the second. I see no difference in the two products. But I do supply more than one link because items don’t hang around forever on Amazon. 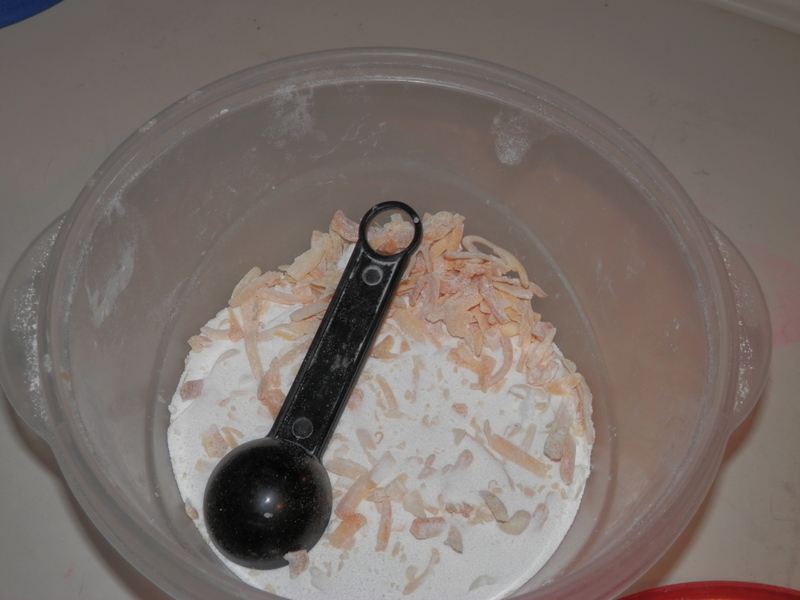 Add homemade soap (see my post Homemade Soap is Cheaper). And fill with water. 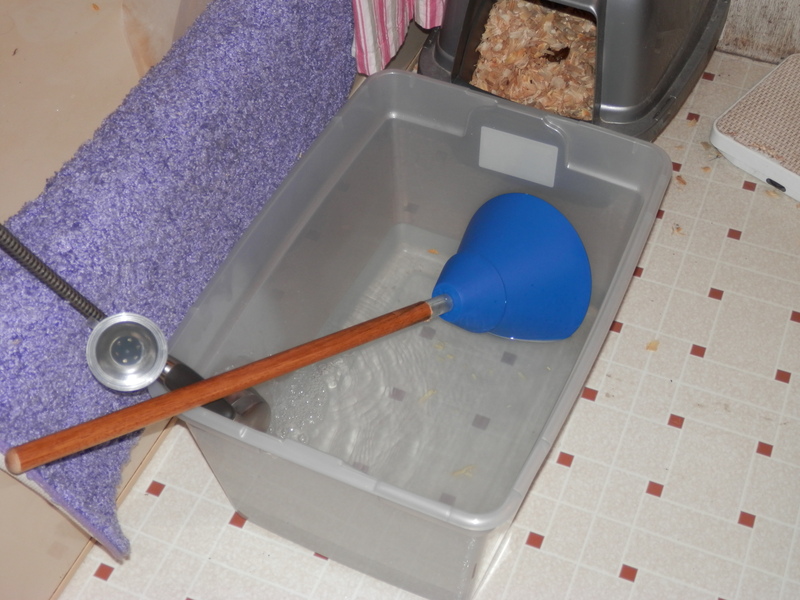 At first I used a large plastic tub. Which held a lot of clothes…but really turned out to be too big. 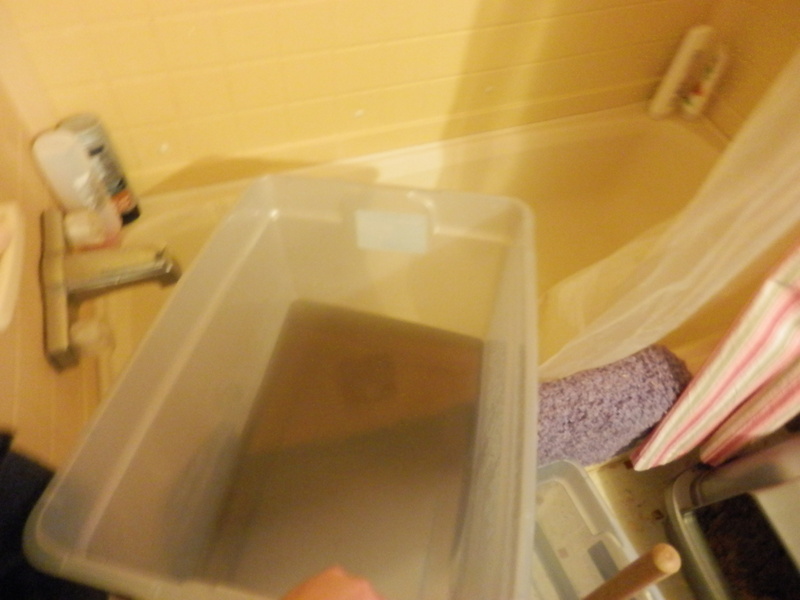 Especially when I had to use the same tub to rinse the clothes. So…I bought two smaller ones…and used my live in help. Until we build our own clothes spinner, I’ll have to use the washer to spin the extra water out. I just set it on the spin cycle and stop it before it starts to fill with water or anything. 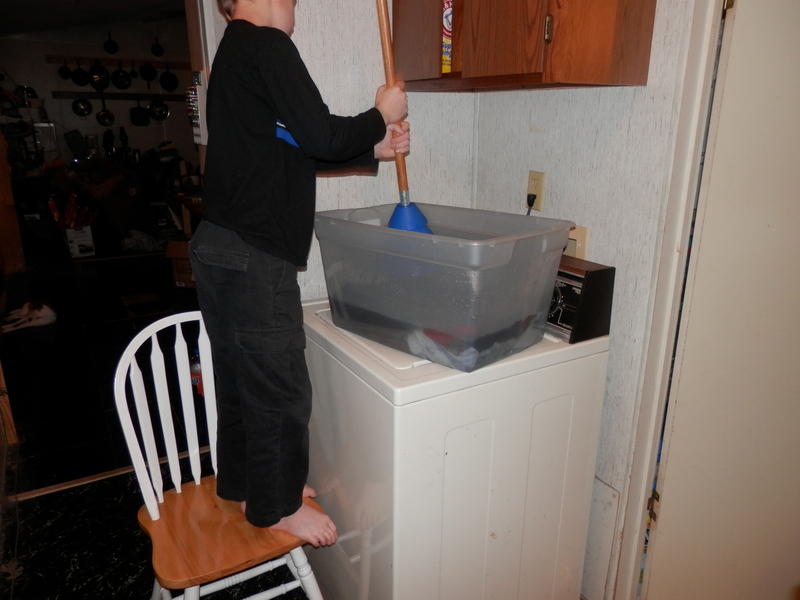 Since it’s just spinning, the clothes don’t get torn from the agitator. Once they are out of the final spin, hang to dry. I noticed I didn’t even need fabric softener this way. My personal belief is because they are cleaner than from the washer. Dirty clothes would need softening. These were supple when I removed them from the line. I smelled the clothes thoroughly and noticed how there was no real smell. 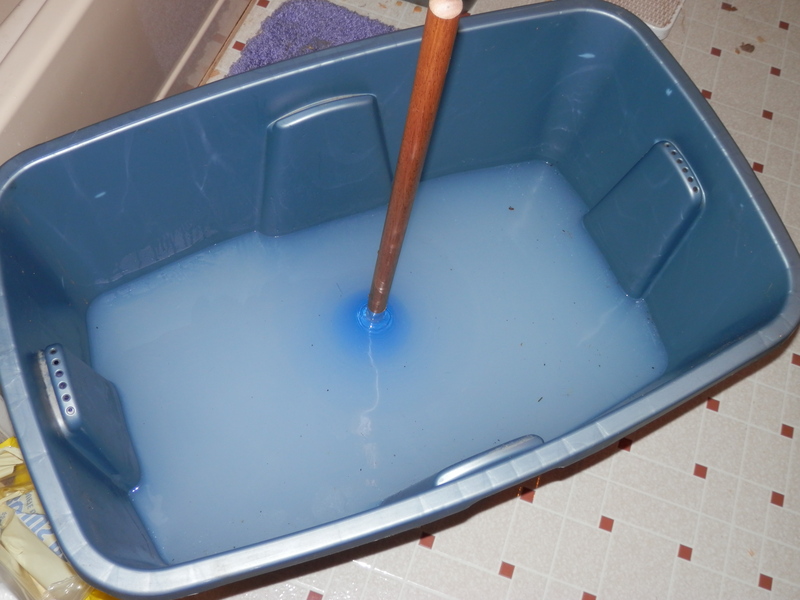 “Clean” laundry usually smells of the fragrances used in the soaps and softeners. 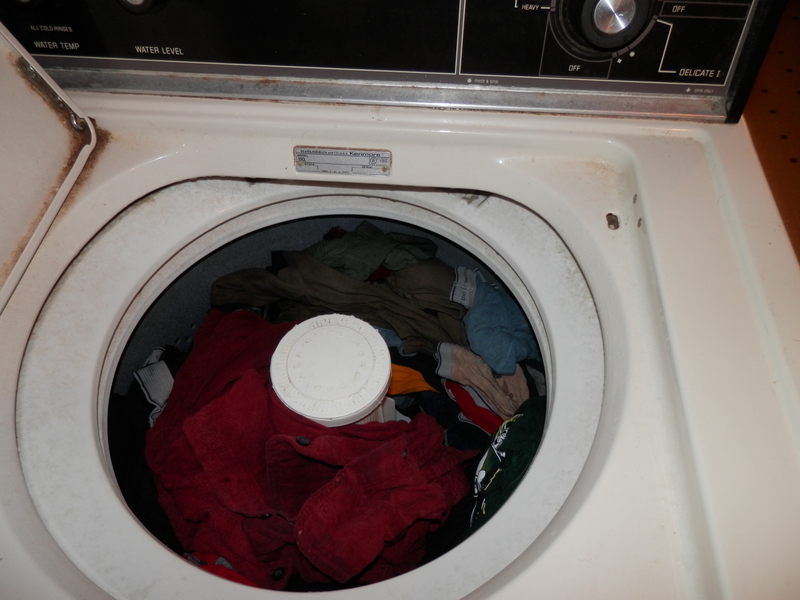 I’ve had several items come from a washer smelling like they never really got washed to begin with, but all of these clothes had no real smell. Apparently that is the true smell of clean. Beginning to end was about 20 minutes. 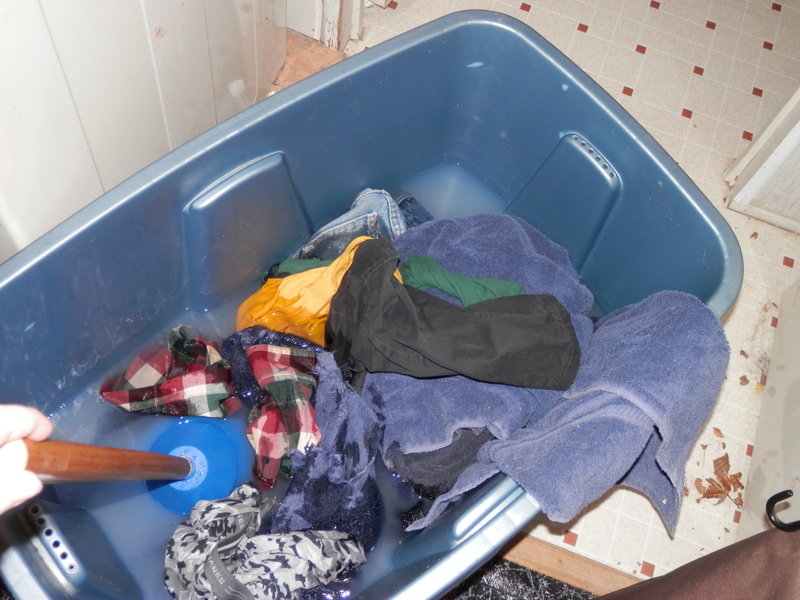 Most of that was waiting for the water to fill the tubs and for the washer to spin. Actual plunging took very little time. 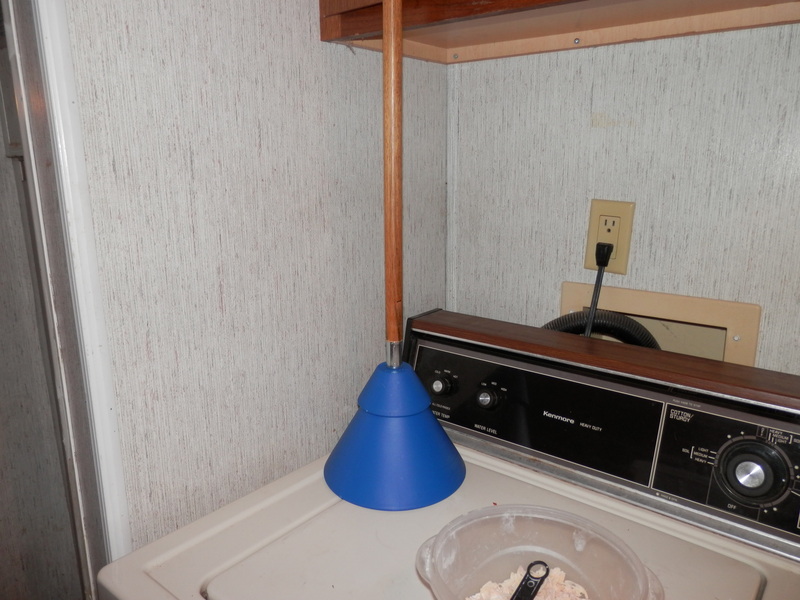 I did notice that it likes to come undone, and I would often have to twist it tight while plunging. If desired, one could easily remedy that with glue. I highly recommend this product, and found it to be very satisfying. 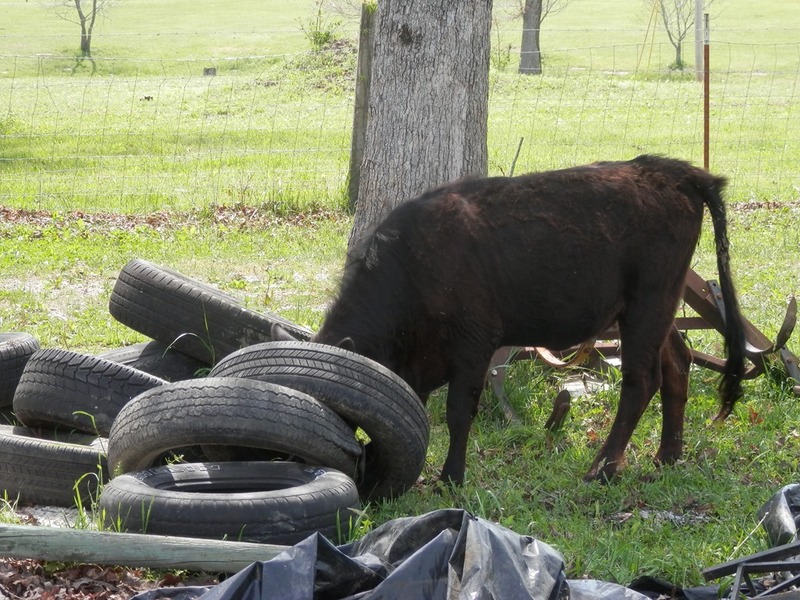 Um…There’s no hay in the tires. I’m beautiful, and I know it! Follow me kid, and you’ll do just fine. Don’t smile. If you smile they can sell you. 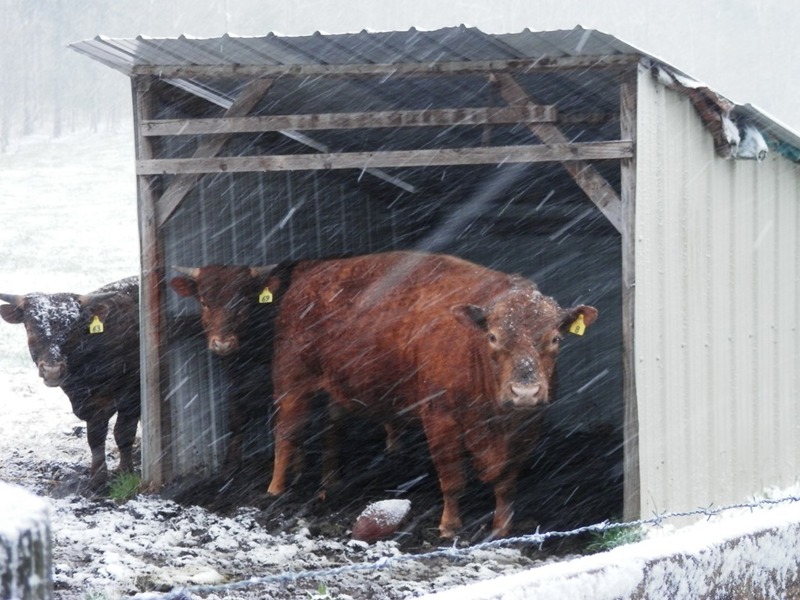 This was that last, horrible snow this winter. I can honestly say I’ve never seen Fargo look so sad before. Pitiful thing! I bought the wrong flour, so these are actually made from white flour, but they turn out just fine. I do like the whole wheat flavor better in this recipe, but to each his own. Add water to the yeast and a spoonful of the sugar and let sit for 5 minutes. The water is a good temp for me personally when I let the hot water warm up to its normal hot temp. And I never let it sit for as long as 5 minutes, usually just 1 or 2. Too much sugar at this point can kill the yeast. HOT water can also. Don’t nuke your water. Add UNmelted butter, egg, the rest of the sugar (you can add less, and I have, but I suggest you start with the recommended amount. 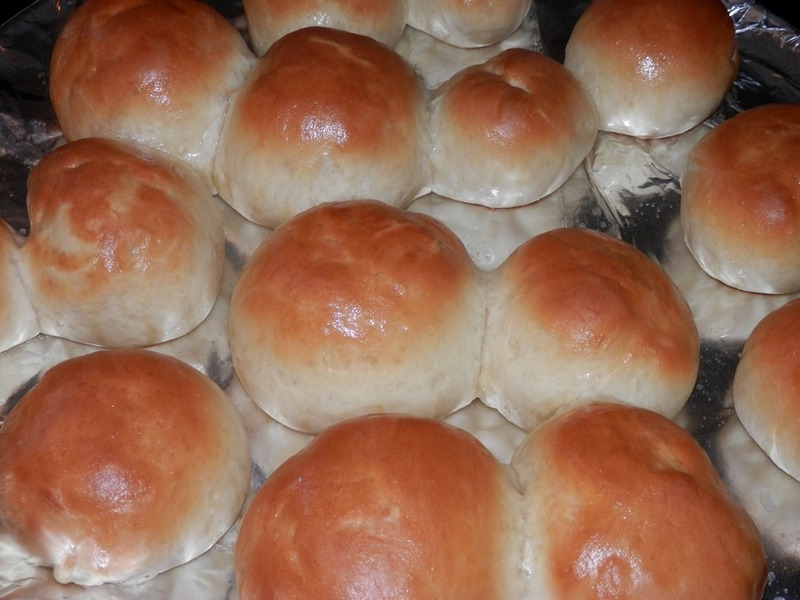 Sugar is the food for the yeast and allows fluffy rolls), and the whole wheat flour. Mix and then add the salt. Salt too early (in a nondiluted mixture) can kill the yeast. Mix well and then add the white flour to the proper dough-ness. Dough-ness, cool, I just made a new word! Knead 6-8 minutes by hand or 2-3 by mixer. You want the dough soft. 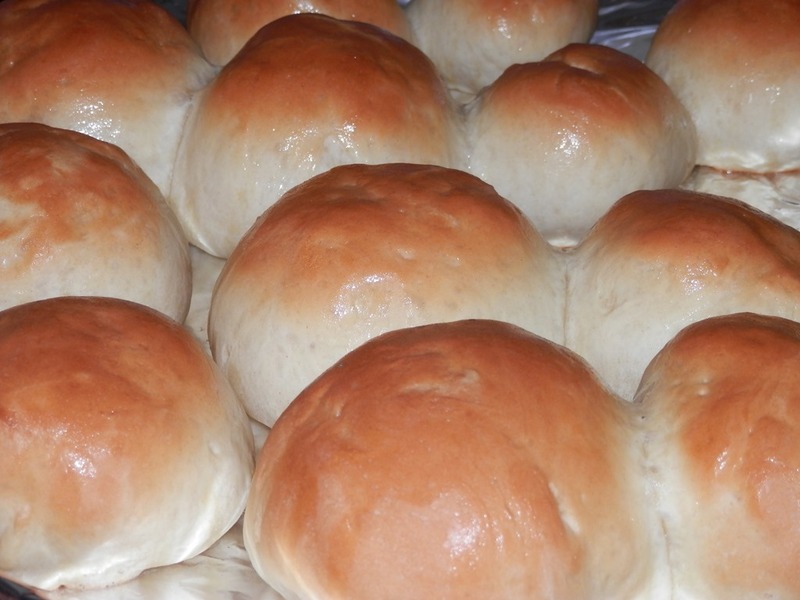 Allowing the dough to harden via too much kneading and/or flour can make for hard rolls that don’t rise well. Your dough needs to be just not sticky, but only just. Rise until double. Divide into 24 balls and rise until double again. Bake at 375 for 11-13 minutes on the middle rack. (You may need longer. You will want the tops to gold up a bit). At this point, I like to brush the tops with melted butter. Enjoy! I printed out sheet after sheet of task and goal planners. None seemed to really make me feel like I was accomplishing anything. Oh sure, all the different colors and lines and check boxes are fun and exciting, but that doesn’t actually do anything. I’ve been working my second job for over a year now, and my planning and goals have spiraled into a depression, a vast frustration. I would schedule chores and work and personal wants only to get exasperated. Then I read something and tried it, and now I pass along what I now practice. Here is how I am accomplishing my goals, maybe you could do the same. First of all, it’s not “accomplishing” your goals that’s the problem, it’s “organizing” them. Step 1: List your goals. This is easy, just jot it down. Keep a list somewhere, and whenever there’s a new goal that you need to do, add it. I use “Sticky Notes” that was built in with my Windows for this (see this post on how I do that) . They’re great for brainstorming and jotting down random thoughts you don’t want to forget. You don’t have to save them and worry where they’re at the next time you need to look at them. You can change colors and fonts and sizes and delete and create, and they’re all just right there convenient for you the next time. I’m just jotting a few that maybe everyone can relate to a little, but let’s face it. If you made a list of ALL your goals, it would be HUGE! Step 2: Break them down. I used to print out a calendar and put one goal on day one, another on day two, etc. I wouldn’t always get them done, and it seemed like I wasn’t getting them done fast enough. Obviously, that wasn’t working. That makes you feel better, right? Step 5: Keep them accomplished. The cars were cleaned out, and now you’re starting on the house. Keep those cars cleaned, or else you’re going to have to add it right back in. Do those little things like keeping a bag in the car for trash. This will be most necessary with the house. Once you tidy that one small little area, KEEP it clean. Keeping the cars and house cleaned become background goals, mere maintenance. If you slip, that’s OK. Just add it back on the list. Step 6: Stop worrying about the other goals and don’t overextend. Remember, while you’re working on goal #1, forget about goal #2. It won’t go away. It’s still on your list where you can go back to it and do it when the time is right. And some goals take a while. If you schedule them in more often than they will actually get worked on, it will only make you feel worse when they don’t get done in time. This has really helped me. By making myself to quit thinking about the other goals, I’m able to actually get them done. I hope it helps you too. For whatever reason, whenever someone is mentally sick, they are ashamed. Why? Did they do something wrong to cause this mental illness? I have had many friends with mental illnesses. All of them were ashamed. Very few people knew the truth about them. I don’t think it needs to be that way. When someone is in a wheelchair, no one assumes “Oh, you were driving drunk and wrecked, you horrible person!” But when someone is schizophrenic, people give them horrible looks, avoid them, and act like they’re dangerous. Society needs more understanding of these people. Society seems perfectly fine with “special” children, but once those children become adults, they’re treated the exact opposite. Well, I didn’t do anything wrong, and I refuse to be ashamed any more. I suffer from anxiety, which has led to depression at times. Here is part of my story. I’ve had some pretty horrible experiences in my life. I was strangled on the kindergarten playground when I was 5. 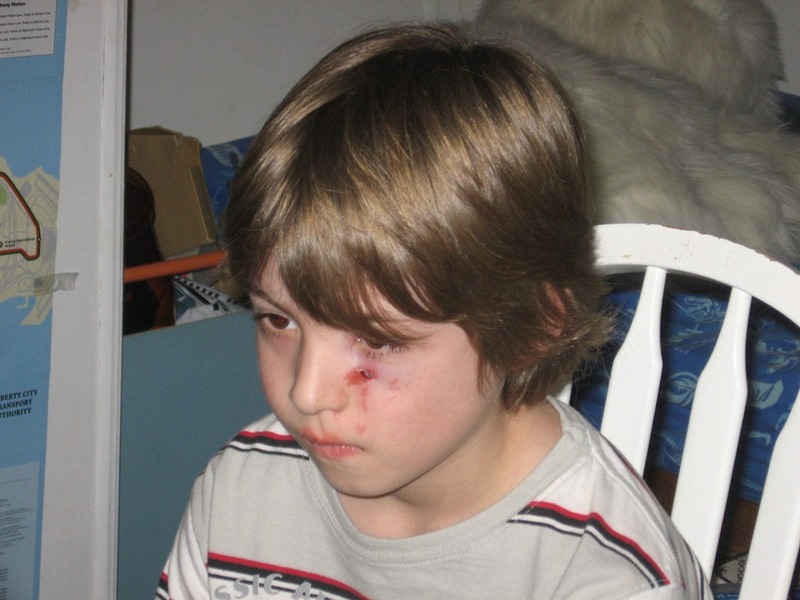 I was bullied horribly by my older brother and his friends. I was rarely trusted by anyone that wasn’t a teacher or school official. I was bullied in middle school. I was so terrified of getting in trouble, I never fought back. (OK, to be honest, I don’t know if I fought back or not because I have no memory of most of it). I begged to fight back, but I wasn’t allowed. Through high school, I was humiliated as many times as possible by a particular teacher. This also occurred with two professors in college. I had a husband who completely “changed” who he was two weeks after we got married. There were girls in college that were just as stupid and mean as middle school. In fact, the girls that I thought were my friends stabbed me in the back over and over again, in really elaborate ways, to the point of unbelievable stupid, like a movie or something. So all of this resulted in a fear of people getting close to me (I never made any friends because they were all evil from my experience), rebellion against authority (trying to constantly make up for not “rebelling” and fighting back in middle school), drowning myself in school and later work (at one point I was working 3 jobs-I drove a school bus in the mornings and evenings, made concrete block in the days, and delivered pizzas at night), and who knows what else. I had several horrible jobs, once I got married the second time. I worked as a construction secretary who’s superintendent died and the new one’s wife wanted my job. I was given a 15 minute notice, and their jerkiness cannot be described accurately with words. Immediately after this, I worked temp for a call center that fired people left and right for no reason whatsoever. They were so crooked, in fact, they had to change their name to stay in business shortly afterwards. Desperate for money, I started cleaning houses. I hate cleaning. My house doesn’t get cleaned like most people clean theirs. But I did it. I finally found a job for a guttering company that accused me of embezzlement and fired me shortly after hiring me. They never could keep anyone there from what I heard afterwards. Supposedly they had someone do it in the past, and they could never get over it, accusing everyone all the time from then on. There’s more after this, and some far, far worse than mentioned. None were my fault. But I thought they were. I accused myself of accepting the wrong jobs, of not handling the bad situations correctly. But my therapist finally allowed me to realize, it was out of my hands. But this therapist didn’t come around until much later. My husband had to take disability. So now, I have to deal with depression, having ZERO money, and all the hate speech from others about “those people on welfare” and “those ‘disabled’ people”. After a few years, I had to get a job. We were going into debt. I applied at Wal-Mart, the only place to work for over 25 miles. I got transferred to a department with a bully. A bully who was rampantly known for trying to get people fired. In fact, it was so horrible to work in that department, that no one would. The only way they could get people to work there was to hire new or transfer the new and ignorant. Hellllloooooo anxiety!!! I had to start taking medication, for the second time. My heart rate skyrocketed, and I put on weight, but I was able to go to work. It was great for months. I thought I was fine. I quit the medication because the side effects were going to kill me. I couldn’t exercise more than 10 minutes, and I was having pains similar to heart trouble in women. After a while off the meds, the anxiety came back. Months later, I was transferred to a different department again. I was happy. I was thrilled. I was finally starting to recover from the medication. But then I found out that Fentress County Board of Education not only hates homeschoolers, they hate Jewish children too. I had to pull my child out of school. They gave him zeros on Rosh Hashanah and Yom Kipper because he wasn’t there. They refused to give him a text book. I had to start homeschooling, again. I was happy to spend time with my child again, and to quit worrying about his schooling and lack of education. Unfortunately, it created even more stress on me, and I couldn’t handle it anymore. I turned the radio up louder and louder every day until I quit trying to hear it anymore. I quit eating, only forcing something down every few days to qualm the pains and keep from passing out. I started having tunnel vision, ringing ears, and night terrors. I would wake up several times a night in a panic attack. I went on meds again, but this time, it only made it worse. Two weeks later, I quit the meds and turned in my notice. My moment of desperation had come. Still needing income, all our other dreams shattered, I decided to file for disability. My friends were supportive. My family was supportive. I was in shock. It’s been 6 months of diet, exercise, and therapy. I’m still overweight by 20 pounds, but I can exercise again. In fact, I’m up to running 7 minutes at a time. I’ve learned and eliminated one of the sources of the anxiety. I go out in public by myself again. I make little circles of fabric for some couple in Crossville for next to nothing. I make a few pennies doing video game reviews on youtube and blogging. My child has an education again, and I dropped the disability claim. Why do I write this? I write this for those out there with anxiety and depression. You are not alone. You are worth it. I have been there. You are stronger than those without anxiety. They’ve never had to deal with it. You have survived. WHAT?!?! Yes, dandelion fritters. Now, even if the thought sickens you, your little boys will love the idea, and they’re safe to eat. Besides, there’s a certain feeling you get from knowing what you can and cannot eat that God doesn’t ask you to grow yourself. It makes you feel more confident and safe. 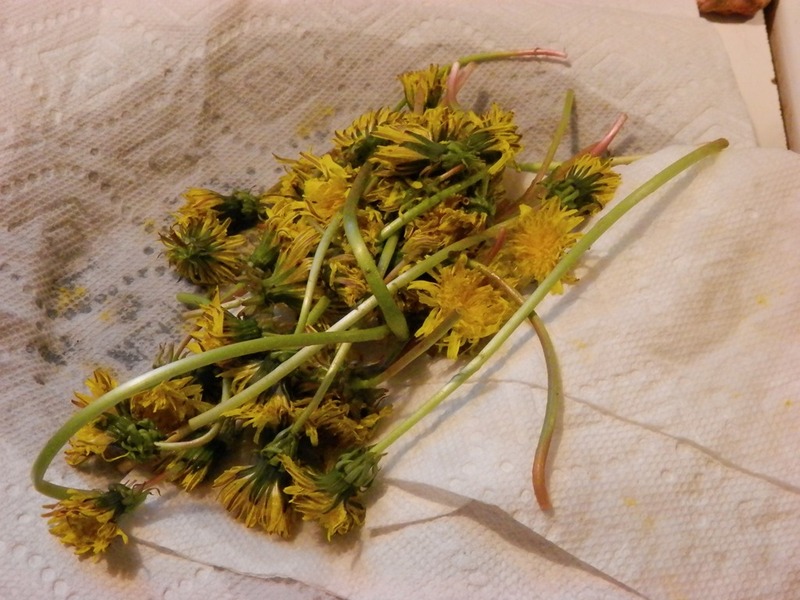 Dandelions are bitter herbs. We usually eat them every Passover. 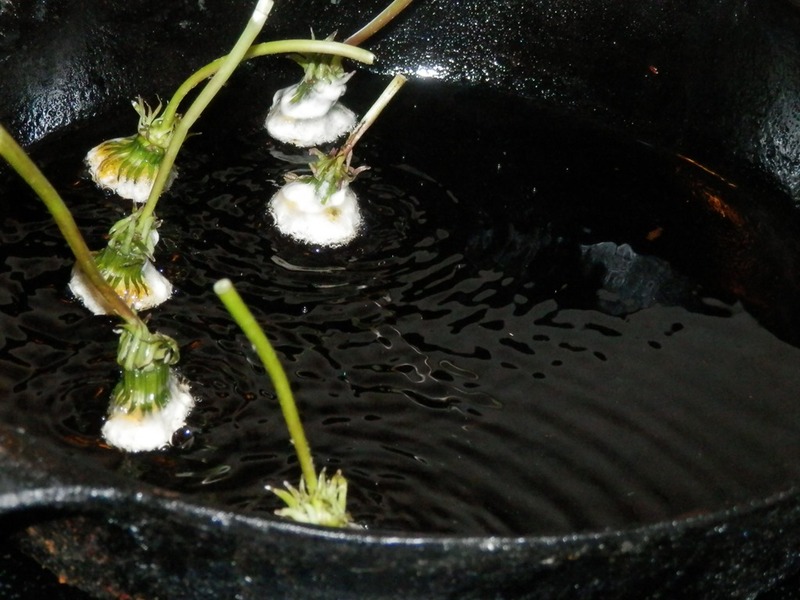 Pick a few dandelions and wash in water. Dry as thoroughly as possible. Here is what I made my batter out of. This is a basic batter. You don’t have to add the baking powder, but you may want to increase the salt if you don’t. Add enough milk to make a pancake batter. At this point, you can add all sorts of things. Many people add a sweetener. I have never added a sweetener to my dandelions, and I have never felt the need to either. You can also add grated cheeses. I would recommend dry, pungent cheeses such as parmesan, feta, swiss, etc. If you are eating this for Passover, your choices off added ingredients will be limited, of course. You can also add herbs. I think basil ( a sweet herb) would be pretty good, or rosemary. 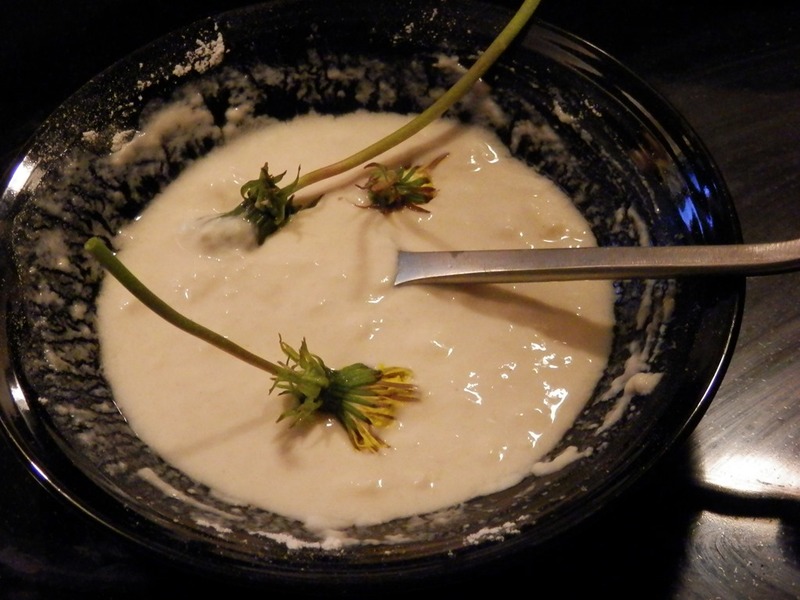 Dip the flowers in the batter, coating them as much as possible. 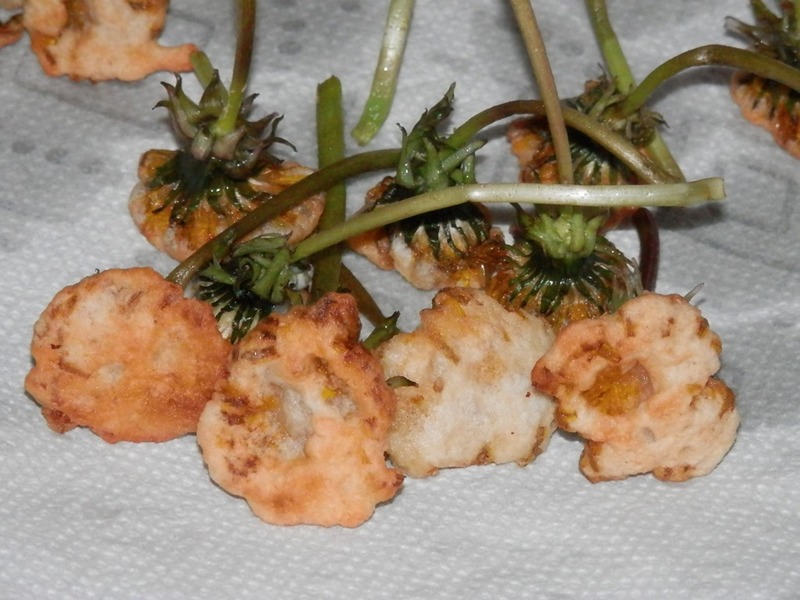 Some people like to chop the blooms off and make a traditional fritter where it’s like a hush puppy instead of just coated. Fry in hot oil. If you decide to make balls, you will probably want deeper oil. Not too long ago, I bought a laptop with Win8. It came with a neat little program called Eylean Tasks. Eylean Tasks is free with Win8, but not so cheap otherwise. In fact, it can get downright expensive. 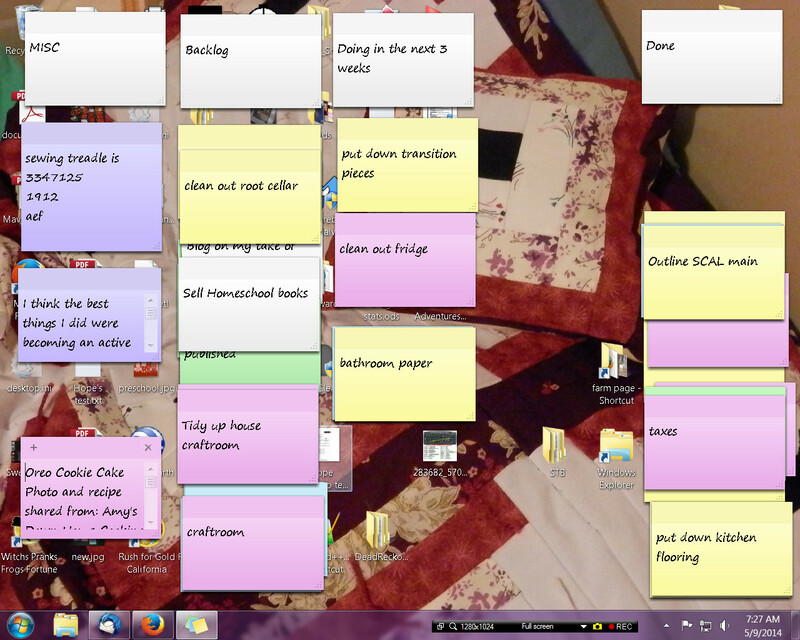 So, when I returned said laptop due to a defect, I fell back to my trusty Sticky Notes on Win7. Start by just adding the column titles. You will need “To Be Done”, “Backlog”, “Done”, and “Doing Now” or something similar. Please visit this blog post for a complete description of goal management and maintenance goals before starting. Then, start writing your tasks. Just write them. One task per note. Size the notes until they’re all pretty uniform in size and small enough to handle. You can then group the tasks into larger projects or break down larger projects into smaller tasks. Now, organize them according to how your brain works, not mine, yours. That’s the beauty of this. You can fit your own thoughts and mind’s organization instead of someone else’s. I added a column for Misc because I need it personally. Some people have separate columns for separate projects. I have grey colors for the column headings, pink for project headings, and yellow for broken down tasks within the projects. Some people have columns for “doing” and “doing next”. I have one for “the next three weeks” (this used to be 7 days, perhaps I should write ‘How to be a Procrastinator’?). I only put what can be done within the next 3 weeks or less, or are maintenance goals. That way I don’t get overwhelmed. When one is finished, I move it to “Done” and move one from “Backlog” to what I’m working on now, if desired. If I have something new come up that doesn’t have to be done NOW, I put it in the backlog and forget about it until I can get to it later. Again, this helps greatly with my goal management. I still get vehemently frustrated that I can’t whip a wand and all is done overnight, or over 5 minutes, I’m not picky, but it has helped me to calm done and stay organized without a forest of postie notes lost throughout the world. 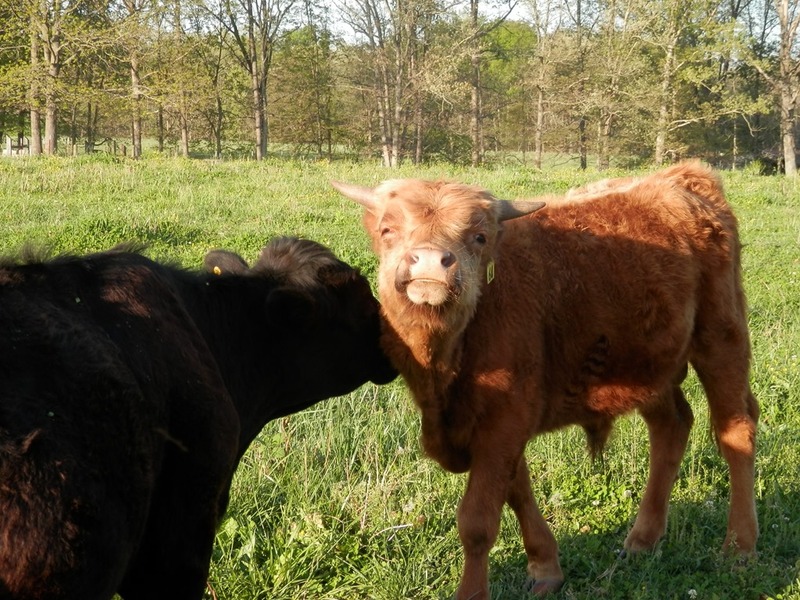 Arlis always wanted a red heifer. I don’t really know why, he just did. He bought Hope a few years ago because she carried red. 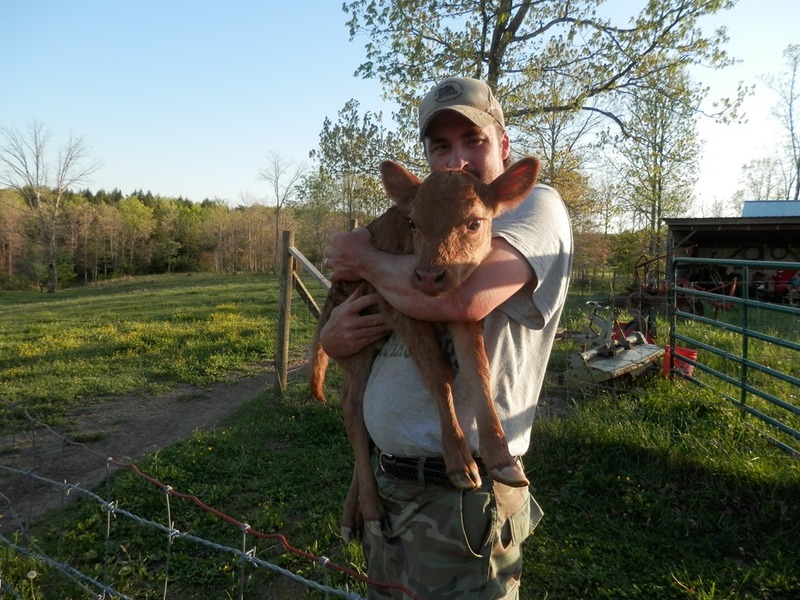 He named her Red Hope. She was 6 months old, and would eventually grow horns. She was mean. 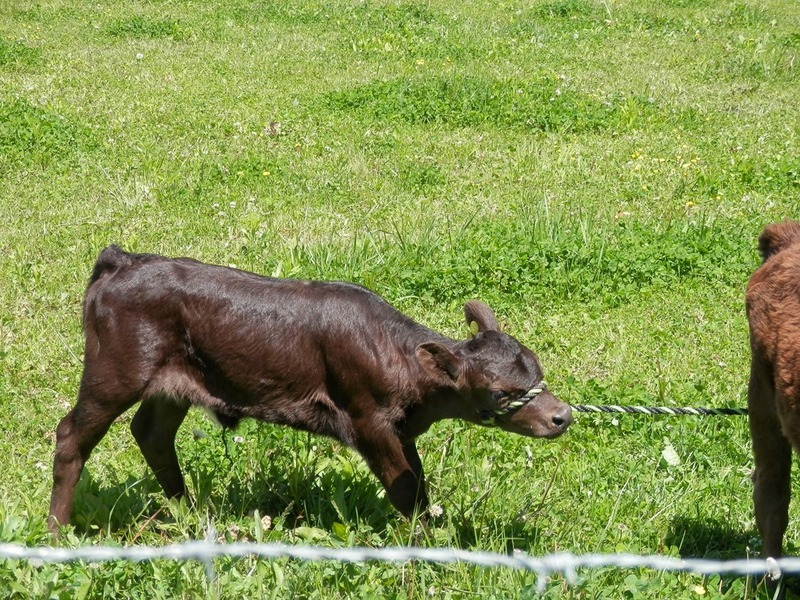 She kicked poor Marcus when she was just a wee calf. She never got real friendly. We do NOT condone dehorning, but with her, we banded her horns. 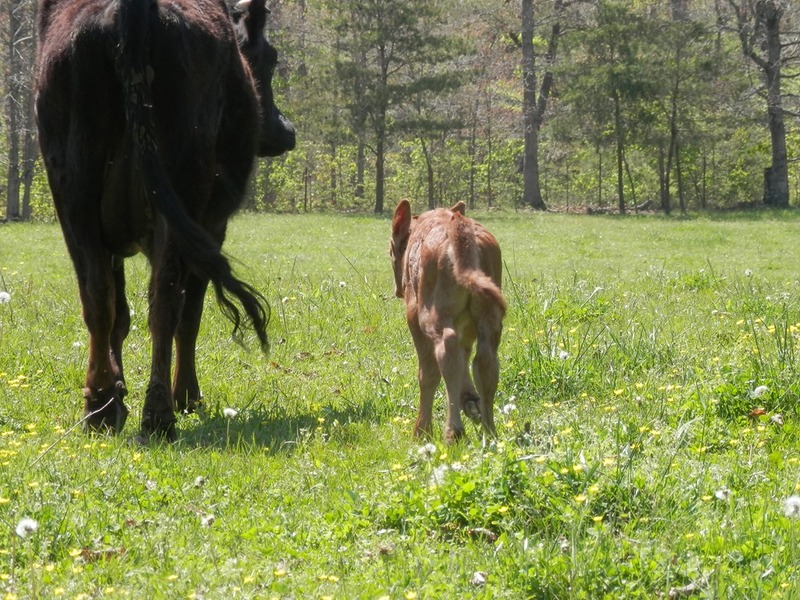 Her first calf was black and called Faith. 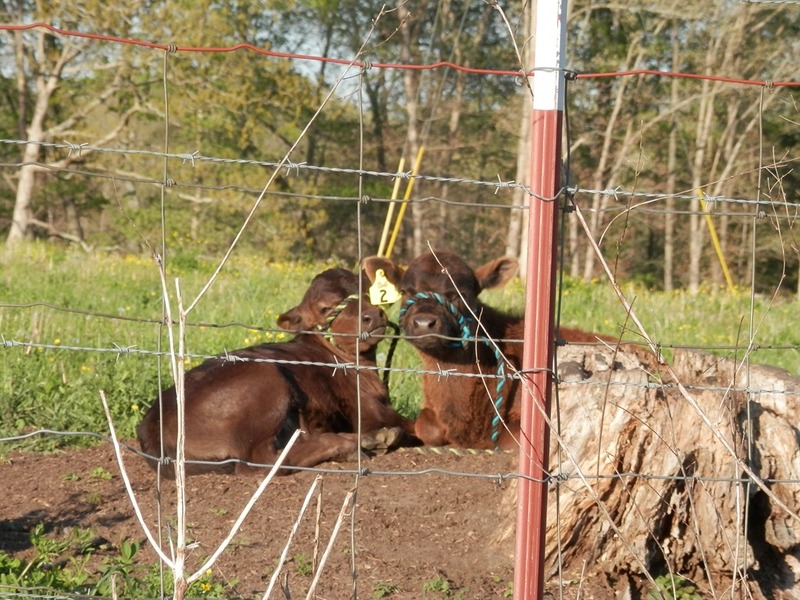 Last night, Arlis put the girls out on the drive so they can mow. This morning, he went to put them back in the lower field. She was dry and full of milk and energy already! Hope was doing great, while Rose was already bucking and running around. 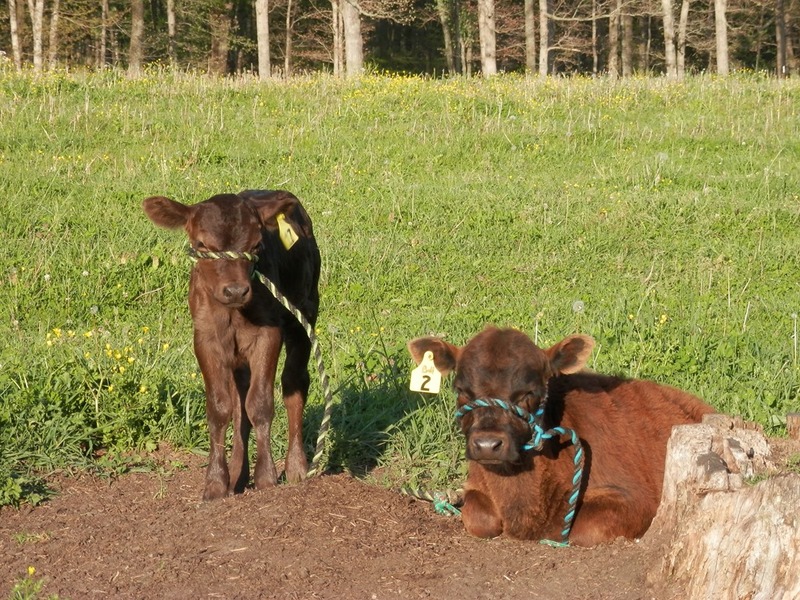 But so was her mother….Aw mooooommmm!!! Not in front of everybody! Can’t you use your hoof?! 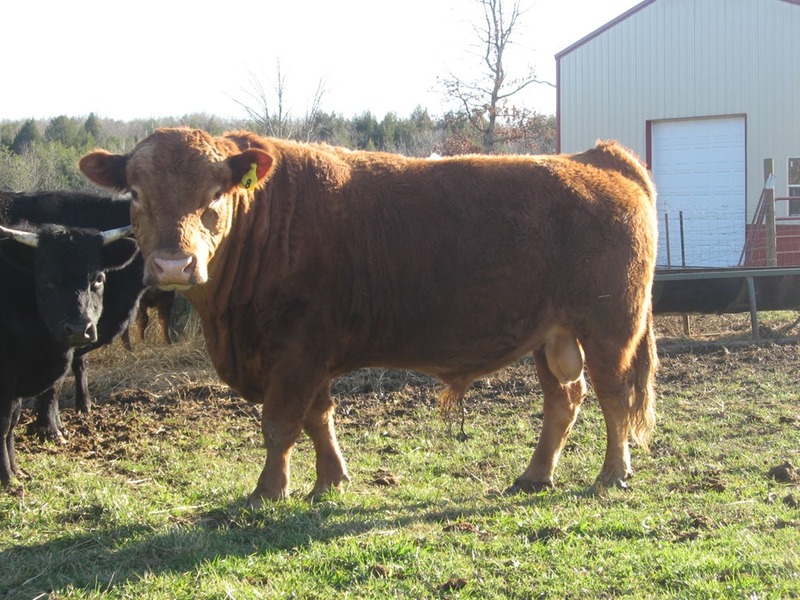 will allow us to have polled red Dexter calves now. Arlis is so excited! My husband hates lamb, but ate two servings of this! 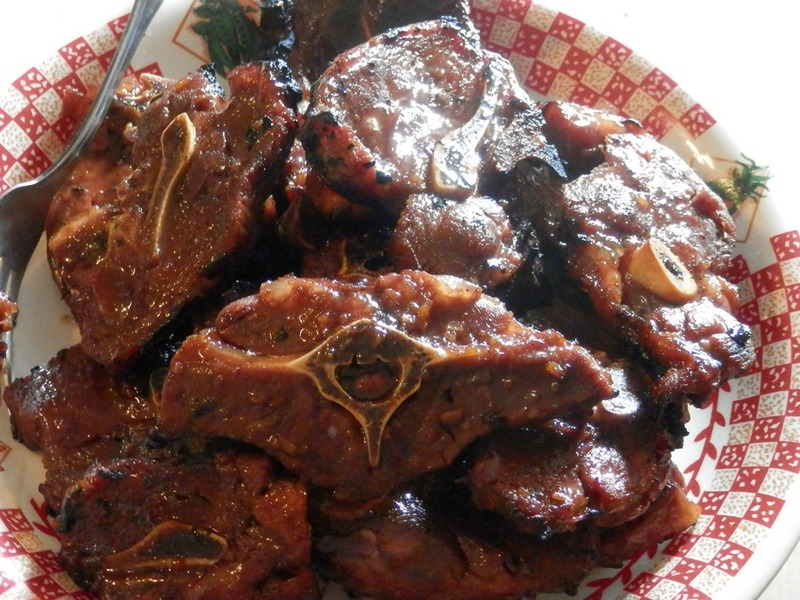 A must try for any lamb lover! Place lamb in pan and cover with water (not the 3/4c). Simmer for 5 minutes. Drain well and mix ALL the ingredients including the 3/4c water. Add this to the pan and simmer until it goes thick and sticky, like a BBQ sauce. This can take a good while. For me, it took over an hour. Plan this part well ahead. Bear in mind, the slower and longer you cook this, the more tender it will be. Once it’s all sticky, you can put it away until that night if you need to. Otherwise, take it to a heated grill and place it on the top rack. Baste with the sauce from the pan and grill 5 minutes each side, or until blackened on edges or grilled to your personal desire.